Nest Cam Outdoor launched with 'Person alerts' feature. Nest Labs today announced the launch of Nest Cam Outdoor and additional features to the Nest Aware service. Nest Cam Outdoor can do all the things Nest Cam Indoor does, and it's fully weatherproof so it works in the snow and the rain. It's easy to install yourself on wood, brick or stucco. It even has a magnetic mount so you can stick it on a rain gutter. With a brand new, completely weatherproof industrial design created for permanent outdoor use, Nest Cam Outdoor extends security outside the home. Customers can keep an eye on their homes 24/7 with full high-definition (1080p) video quality anytime, anywhere and in any weather. Customers also get all the great features Nest Cam Indoor is known for, including activity alerts and Talk and Listen. Nest Cam Outdoor automatically works with the rest of your home. If Nest Cam Outdoor notices activity, your Philips Hue or LIFX light bulbs can automatically turn on to make it look like someone's home. Subscribers to the Nest Aware service will receive person alerts, allowing Nest Cam to distinguish between a person and another activity and let you know when someone comes into view. Person alerts are the first of a new generation of intelligent alerts from Nest that leverage Google's expertise in machine learning and powerful algorithms to deliver deeper insights to customers about what’s happening at home. Nest Aware features including person alerts are available on all Nest Cam and Dropcam cameras. 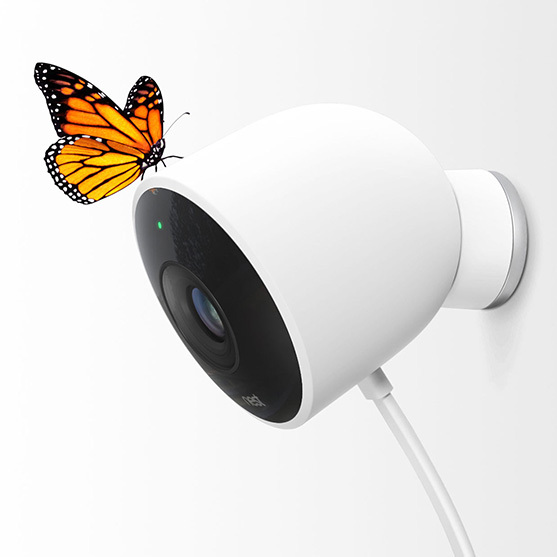 + Weatherproof - The weatherproof design of Nest Cam Outdoor meets the demands of a broad range of temperatures and conditions faced by outdoor cameras. + Easy outdoor setup - Nest Cam Outdoor has a quick, simple setup. Just plug in the cable and adapter, mount the camera, and go. A powerful magnetic base allows people to securely place it in even more locations and capture the view they want. + Clear 24/7 live video - A 130° view through a high quality glass lens shows the full picture in crisp 1080p HD. When it’s dark, Night Vision illuminates the whole scene with 8 powerful infrared LEDs. And with the Nest app, customers can control and watch live video from anywhere, anytime. + Secure Streaming - Stream and store video content using powerful encryption technology seamlessly (2048-bit RSA key with 128-bit SSL connection). + Talk and Listen - See someone at the door, talk back to get their attention thanks to the built in speaker and microphone. Or tell the delivery man to go ahead and leave the package around back. Nest Cam Outdoor will be available in the U.K., France, Netherlands, Belgium and Republic of Ireland later this year.